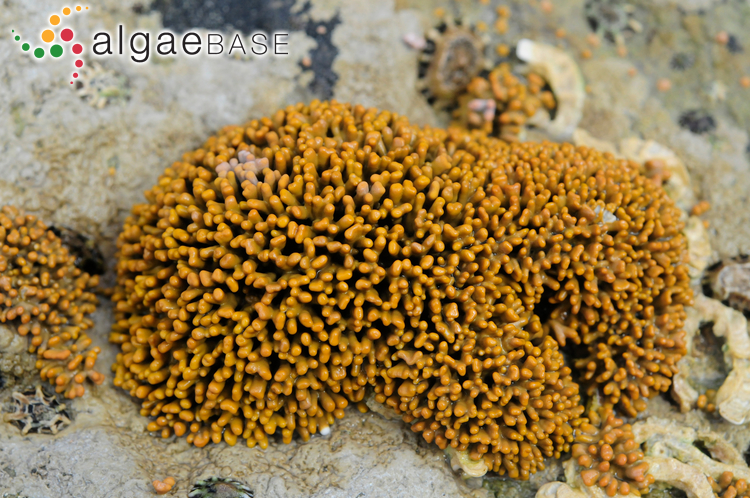 Spongites hyperella (Foslie) D.L.Penrose, Safety Cove, Tasmania, Australia. 01 Nov 2009. M.D. Guiry. © Michael Guiry (mike.guiry@nuigalway.ie). Published in: Penrose, D.L. (1996). Genus Spongites Kützing. In: The Marine benthic flora of South Australia. Rhodophyta. Part IIIB, Gracilariales, Rhodymeniales, Corallinales and Bonnemaisoniales. (Womersley, H.B.S. Eds), pp. 273-280. Canberra: Australian Biological Resources Study. Type locality: Western Port, Victoria (Penrose 1996: 275). Lectotype: J. Gabriel ; 1899; 3-5 fathoms. TRH A4-190 (Woelkerling et al. 2005: 46). Notes: Designated by Adey in Adey & Lebednik (1967: 19); illustrated by Penrose (1990: fig. 33A-C, unpublished PhD thesis). Womersely (1984: 47) considered the species to be a dominant alga in the lower intertidal zone along Tasmanian coasts subject to strong wave action (Pentose in Womersely 1996: 275).